For accurate measurement and monitoring of high D.C. voltage levels, AEB Sapphire’s voltage dividers are an ideal, cost-effective solution. Shown to the left is a 120KV model in the standard tube-mounted style with an open high voltage termination. 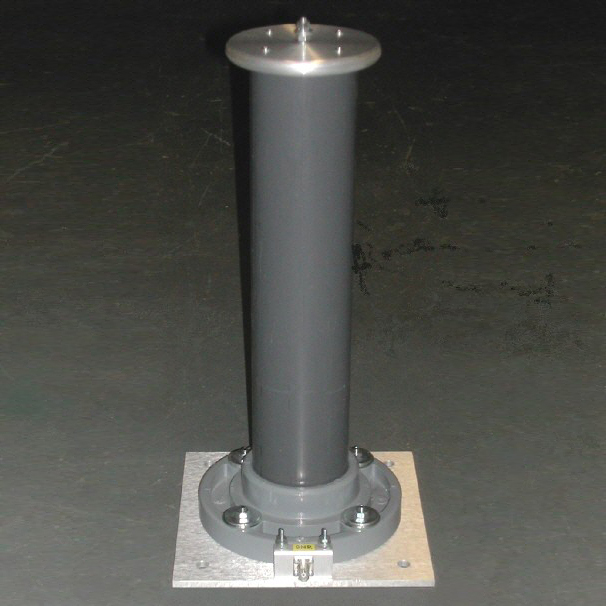 A 9″ x 9″ aluminum baseplate is provided for secure mounting and operation in any position. This style contains an array of precision HV resistors which are sealed and protected by solid encapsulation. Our solid silicone encapsulant provides superior insulation, stability and ruggedness for long-term monitoring of high voltage conditions. It is also the most economical design approach. The standard BNC output connector provides a ratiometric output at one ten-thousandth (10,000:1) of the total voltage. Custom ratios are available upon request at 1000:1, 100,000:1 or other desired value. A current output (no shunt resistor) is also available, which is useful in driving analog meter movements. Call or E-mail us at our Contact page to obtain more information about high voltage dividers.